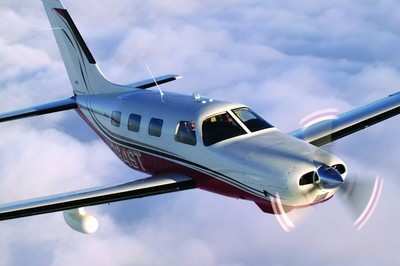 Crossed aileron cables in a Piper Malibu Mirage that had just been through a maintenance procedure have been cited as the probable cause of an accident May 7, 2015 in Spokane, WA. Two people were fatally injured in the accident. In its probable cause report, the NTSB said that the commercial pilot was departing on a local post-maintenance test flight in the single-engine airplane; Four aileron cables had been replaced during the maintenance. Shortly after takeoff, the airplane began to roll right. As the climb progressed, the roll became more pronounced, and the airplane entered a spiraling dive. The pilot was able to maintain partial control after losing about 700 ft of altitude; he guided the airplane away from the airport and then gradually back for a landing approach. During this period, he reported to air traffic control personnel that the airplane had a "heavy right aileron." As the airplane passed over the runway threshold, it rolled right and crashed into a river adjacent to the runway. Postaccident examination of the airplane revealed that the aileron balance and drive cables in the right wing had been misrouted and interchanged at the wing root. Under this condition, both the left and right ailerons would have deflected in the same direction rather than differentially. Therefore, once airborne, the pilot was effectively operating with minimal and most likely unpredictable lateral control, which would have been exacerbated by wind gusts and propeller torque and airflow effects. The sections of the two interchanged cables within the wing were about equal lengths, used the same style and size of termination swages, and were installed into two same-shape and -size receptacles in the aileron sector wheel. In combination, this design most likely permitted the inadvertent interchange of the cables, without any obvious visual cues to maintenance personnel to suggest a misrouting. The maintenance manual contained specific and bold warnings concerning the potential for cable reversal. Although the misrouting error should have been obvious during the required postmaintenance aileron rigging or function checks, the error was not detected by the installing mechanic. Although the installing mechanic reported that he had another mechanic verify the aileron functionality, that other mechanic denied that he was asked or that he conducted such a check. The mechanic who performed the work also signed off on the inspection; this is allowed per Federal regulations, which do not require an independent inspection by someone who did not perform the maintenance. The pilot did perform a preflight check; the preflight checklist included confirmation of "proper operation" of the primary flight controls from within the cockpit. Although the low-wing airplane did not easily allow for a differential check of the ailerons during the walk-around, both ailerons could be seen from the pilot's seat; therefore, the pilot should have been able to recognize that the ailerons were not operating differentially. The accident occurred at the end of the business day, and the airplane had been undergoing maintenance for a longer-than-anticipated period. The airplane's owner was flying in from another part of the country via a commercial airline to pick up the airplane the following morning. The accident pilot, who was an engineer at the company and typically flew postmaintenance test flights, was assisting with returning the airplane to service. He also had an appointment with an FAA medical examiner the next morning (Friday), and he typically did not work on Fridays. It is likely that the mechanic and pilot felt some pressure to be finished that day so the owner could depart in the morning and the pilot could attend his appointment. The National Transportation Safety Board determines the probable cause(s) of this accident to be: The mechanic's incorrect installation of two aileron cables and the subsequent inadequate functional checks of the aileron system before flight by both the mechanic and the pilot, which prevented proper roll control from the cockpit, resulting in the pilot's subsequent loss of control during flight. Contributing to the accident was the mechanic's and the pilot's self-induced pressure to complete the work that day.